This teargas grenade was made of tin plate and is fitted with a Striker Mechanism No.3. 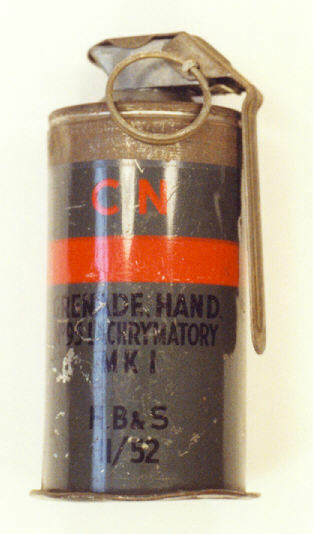 Before throwing, the igniter had to inserted by the user, as it was issued separately . The grenade would emit teargas in smoke form for 8seconds. Filling : 113gram CN composition "PN748" and a small burster charge. This grenade found use between 1952 to 1958.